April 26, 2012 TeresaWho's Your Daddy? Noah is slowly, very slowly getting his training. 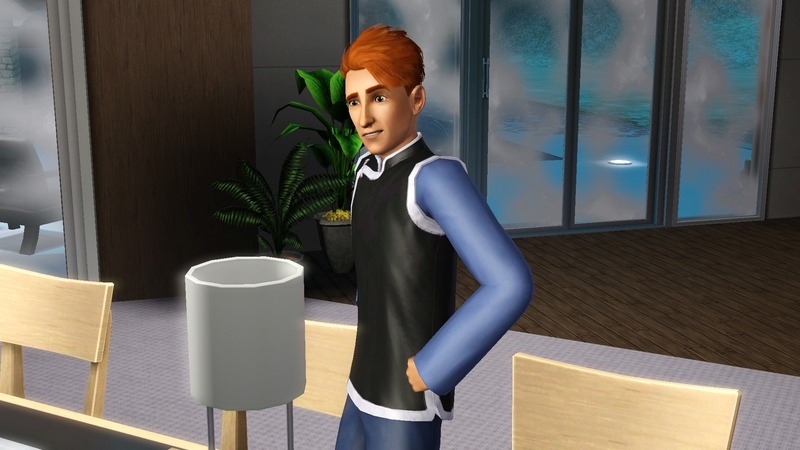 And Jackson’s makeover / what he really looks like unghosted. Lily makes the honor roll and gets to join the teens. Lily inherited her daddy’s ears so a makeover was definitely required. Juliana finally succeeds in discovering the Young Again potion. She makes an extra one and gives them to Benjamin to take when necessary so he should now live until the end of the challenge. Benjamin finally earns enough points to change his lifetime wish from Heartbreaker to Tinkerer. His logic is at level 4 and his handiness is at level 8 so he should complete this soon enough. Child Gnome. Still he is the only one, no more baby gnomes yet. Madelyn is the first child to use the play oven. And she burns the muffins. Olivia becomes and toddler and starts her training with Juliana about to pop out P, as is apparently becoming our usual timing. Olivia Spam because I am getting tired of taking the same pictures over and over. She learned to potty and talk and almost to walk before her needs hit bottom. Putting Olivia to bed, but without feeding her first. Juliana realizes Olivia is hungry so she sets out to remedy that. However she really is about to pop so can she get the starving toddler fed before she goes into labor? Success! The toddler has her bottle. Barely in time though, as she goes into labor immediately after handing the bottle to Olivia. And of course Benjamin decides to put Olivia in the crib waking her up just in time to see the birth.